This is the second of four conversations Gudrun had during the British Applied Mathematics Colloquium which took place 5th – 8th of April 2016 in Oxford. Helen Wilson always wanted to do maths and had imagined herself becoming a mathematician from a very young age. But after graduation she did not have any road map ready in her mind. So she applied for jobs which - due to a recession - did not exist. Today she considers herself lucky for that since she took a Master's course instead (at Cambridge University), which hooked her to mathematical research in the field of viscoelastic fluids. She stayed for a PhD and after that for postdoctoral work in the States and then did lecturing at Leeds University. Today she is a Reader in the Department of Mathematics at University College London. So what are viscoelastic fluids? If we consider everyday fluids like water or honey, it is a safe assumption that their viscosity does not change much - it is a material constant. Those fluids are called Newtonian fluids. All other fluids, i.e. 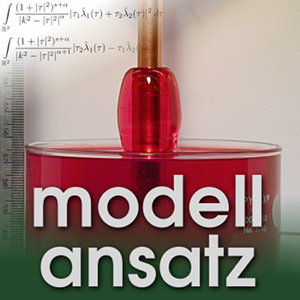 fluids with non-constant viscosity or even more complex behaviours, are called non-Newtonian and viscoelastic fluids are a large group among them. Already the name suggests, that viscoelastic fluids combine viscous and elastic behaviour. Elastic effects in fluids often stem from clusters of particles or long polymers in the fluid, which align with the flow. It takes them a while to come back when the flow pattern changes. We can consider that as keeping a memory of what happened before. This behaviour can be observed, e.g., when stirring tinned tomato soup and then waiting for it to go to rest again. Shortly before it finally enters the rest state one sees it springing back a bit before coming to a halt. This is a motion necessary to complete the relaxation of the soup. Another surprising behaviour is the so-called Weissenberg effect, where in a rotation of elastic fluid the stretched out polymer chains drag the fluid into the center of the rotation. This leads to a peak in the center, instead of a funnel which we expect from experiences stirring tea or coffee. The big challenge with all non-Newtonian fluids is that we do not have equations which we know are the right model. It is mostly guess work and we definitely have to be content with approximations. And so it is a compromise of fitting what we can model and measure to the easiest predictions possible. Of course, slow flow often can be considered to be Newtonian whatever the material is. The simplest models then take the so-called retarded fluid assumption, i.e. the elastic properties are considered to be only weak. Then, one can expand around the Newtonian model as a base state. The first non-linear model which is constructed in that way is that of second-order fluids. They have two more parameters than the Newtonian model, which are called normal stress coefficients. The next step leads to third-order fluids etc. In practice no higher than third-order fluids are investigated. Of course there are a plethora of interesting questions connected to complex fluids. The main question in the work of Helen Wilson is the stability of the flow of those fluids in channels, i.e. how does it react to small perturbations? Do they vanish in time or could they build up to completely new flow patterns? In 1999, she published results of her PhD thesis and predicted a new type of instability for a shear-thinning material model. It was to her great joy when in 2013 experimentalists found flow behaviour which could be explained by her predicted instability. More precisely, in the 2013 experiments a dilute polymer solution was sent through a microchannel. The material model for the fluid is shear thinning as in Helen Wilson's thesis. They observed oscillations from side to side of the channel and surprising noise in the maximum flow rate. This could only be explained by an instability which they did not know about at that moment. In a microchannel inertia is negligible and the very low Reynolds number of suggested that the instability must be caused by the non-Newtonian material properties since for Newtonian fluids instabilities can only be observed if the flow configuration exeeds a critical Reynolds number. Fortunately, the answer was found in the 1999 paper. Of course, even for the easiest non-linear models one arrives at highly non-linear equations. In order to analyse stability of solutions to them one firstly needs to know the corresponding steady flow. Fortunately, if starting with the easiest non-linear models in a channel one can still find the steady flow as an analytic solution with paper and pencil since one arrives at a 1D ODE, which is independent of time and one of the two space variables. The next question then is: How does it respond to small perturbation? The classical procedure is to linearize around the steady flow which leads to a linear problem to solve in order to know the stability properties. The basic (steady) flow allows for Fourier transformation which leads to a problem with two scalar parameters - one real and one complex. The general structure is an eigenvalue problem which can only be solved numerically. After we know the eigenvalues we know about the (so-called linear) stability of the solution. An even more interesting research area is so-called non-linear stability. But it is still an open field of research since it has to keep the non-linear terms. The difference between the two strategies (i.e. linear and non-linear stability) is that the linear theory predicts instability to the smallest perturbations but the non-linear theory describes what happens after finite-amplitude instability has begun, and can find larger instability regions. Sometimes (but unfortunately quite rarely) both theories find the same point and we get a complete picture of when a stable region changes into an unstable one. One other really interesting field of research for Helen Wilson is to find better constitutive relations. Especially since the often used power law has inbuilt unphysical behaviour (which means it is probably too simple). For example, taking a power law with negative exponent says that In the middle of the flow there is a singularity (we would divide by zero) and perturbations are not able to cross the center line of a channel. Also, it is unphysical that according to the usual models the shear-thinning fluid should be instantly back to a state of high viscosity after switching off the force. For example most ketchup gets liquid enough to serve it only when we shake it. But it is not instantly thick after the shaking stops - it takes a moment to solidify. This behaviour is called thixotropy. H. Wilson: UCL Lunch Hour Lectures, Feb. 2016. H.J. Wilson and J.M. Rallison: Instability of channel flow of a shear-thinning White–Metzner fluid, Journal of Non-Newtonian Fluid Mechanics 87 (1999) 75–96. Hugues Bodiguel, Julien Beaumont, Anaïs Machado, Laetitia Martinie, Hamid Kellay, and Annie Colin: Flow Enhancement due to Elastic Turbulence in Channel Flows of Shear Thinning Fluids, Physical Review Letters 114 (2015) 028302. Non-Newtonian Fluids Explained, Science Learning.